Squash House Quilts: Mid-Week Garden Report! I know I said I would post a quilt finish on this post, but I've been waiting for better light for a good photo, so I'll make you wait just a tad longer! Instead, I'm bringing you a mid-week garden report. Mr. Squash and I have been very busy filling up the raised beds with soil in preparation for seed planting next week. Talk about labor-intensive! We fall into bed every night and sleep soundly! We also have found that our bodies are protesting this hard work much more than when we were a little younger! But it gives us a good feeling to know the outcome should be spectacular by mid-summer! Here is our very first (and probably only) apple tree! It arrived yesterday from Stark Brothers Nursery. It's a semi-dwarf Honeycrisp Apple - my all-time favorite apple! It will grow to a maximum of 5 feet high and 4 feet wide. Stark Brothers assured me it would pollinate from the neighbor's mature apple tree which is just over the other side of the fence here. See that mulch I spread around the base per their instructions? It was sold to us at Home Depot as garden soil! It's nothing but shredded wood and we were quite disappointed! But at least we can use it as mulch! 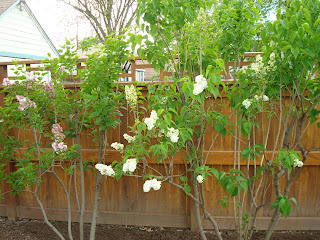 These lilac bushes were a total mess when we moved in. I trimmed them severley last fall and didn't expect to see any blooms for a while - but here they are just beginning to bud out! 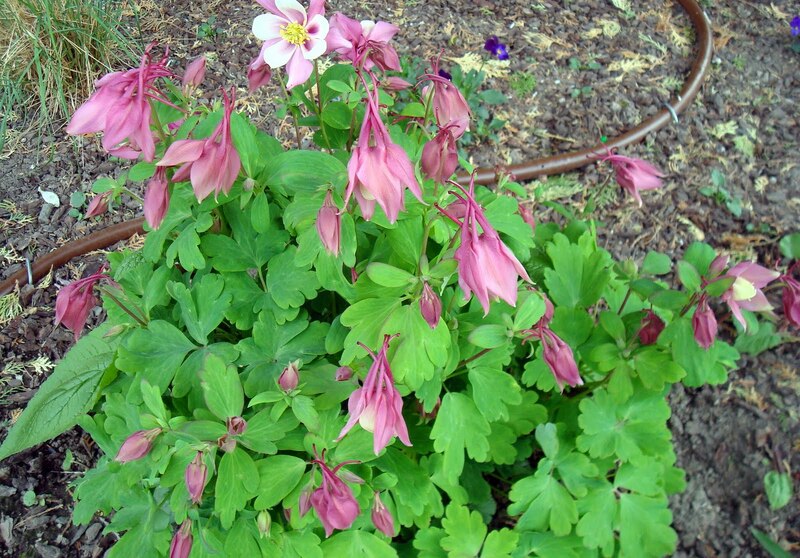 Look at this Columbine - click on the photo for the full effect. It isn't even totally bloomed yet! 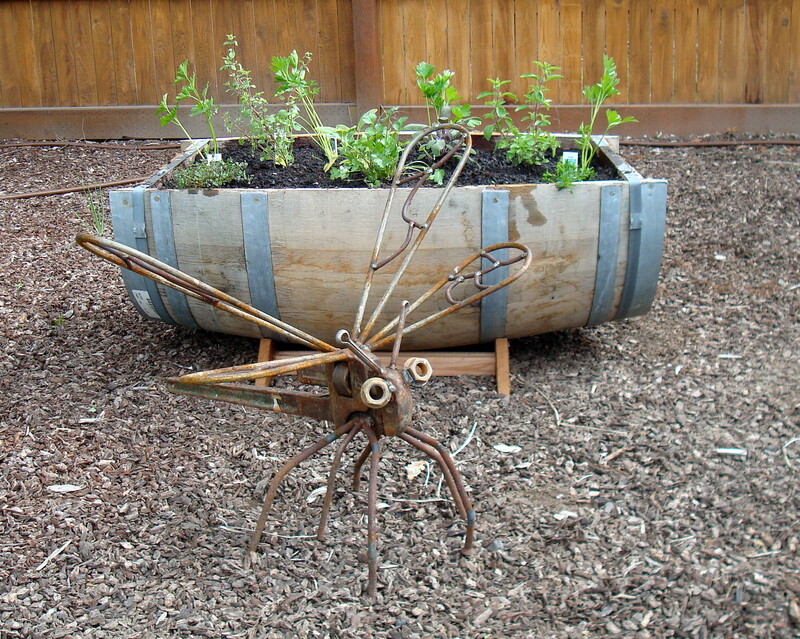 I finally got the wine barrel planted with herbs. There was red wine in this barrel and it is still stained red and crystallized - I wonder if it will impart any flavor to the herbs (wink). I also moved the dragonfly in front of it - trying to find just the right spot for him! 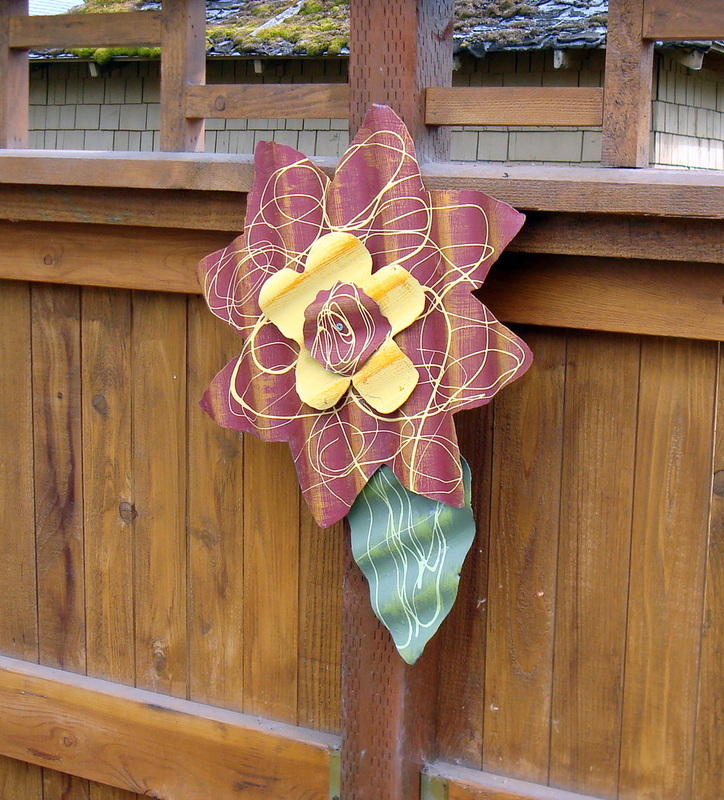 Speaking of garden art - we got this wonderful fence flower and the craft show recently. It's just painted, corrugated metal! Oh - and that mossy roof behind the fence belongs to the neighbor! I gave up on last year's Rosemary bush - should have brought it in over the winter. So I got a new one and once it's grown some more I plan to trim it into a tree shape! On the cooking front I have really been wanting a griddle to make pancakes and English Muffins. I've made pancakes on the gas grill, but the heat is not consistent, so I figured a griddle was the way to go. 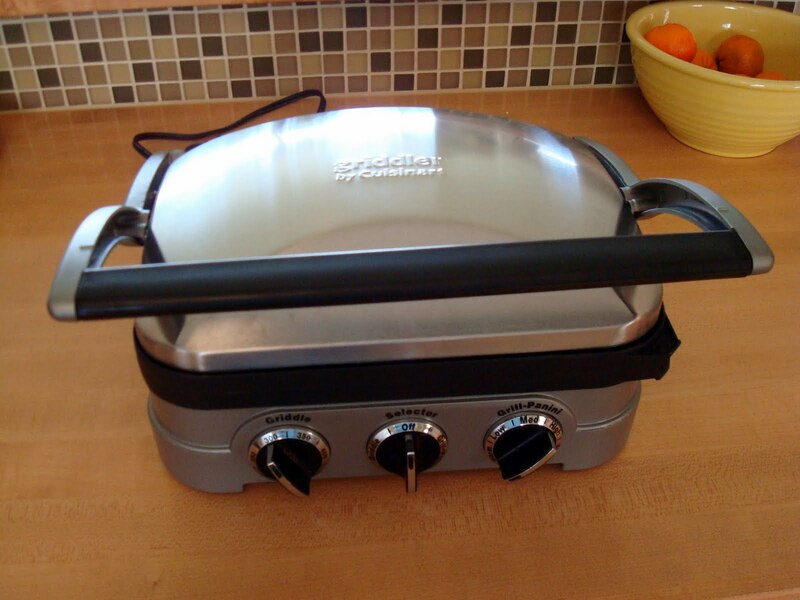 We stopped in the local kitchen shop and found this very cool Cuisinart griddle/panini maker! It has interchangeable grills - flat and ridged. Here is how it looks in the flat position. 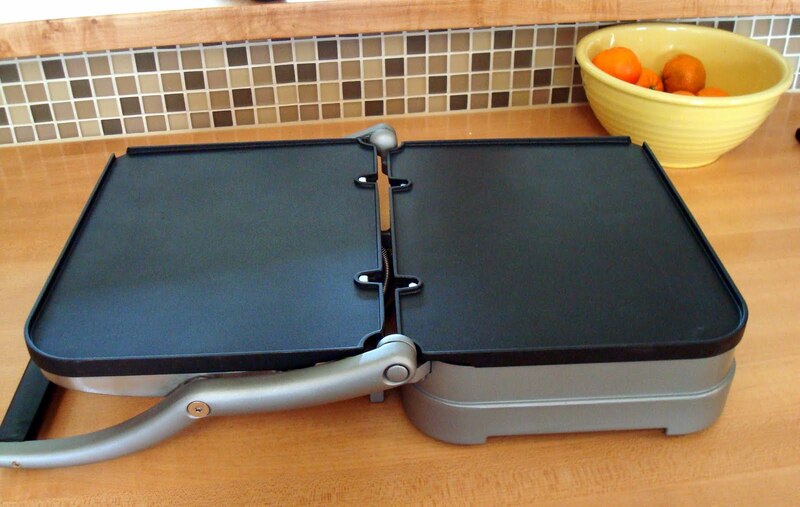 Depending on how many pancakes you want, you can use one or both sides! I want to make just about everything in the recipe book that was included! 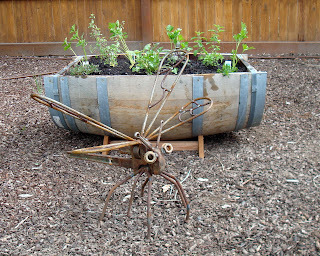 I really love your herb garden in the wine barrel. The Farmer and His Wife have a beautiful garden! It is a good kind of body ache knowing that you will reap a harvest later. 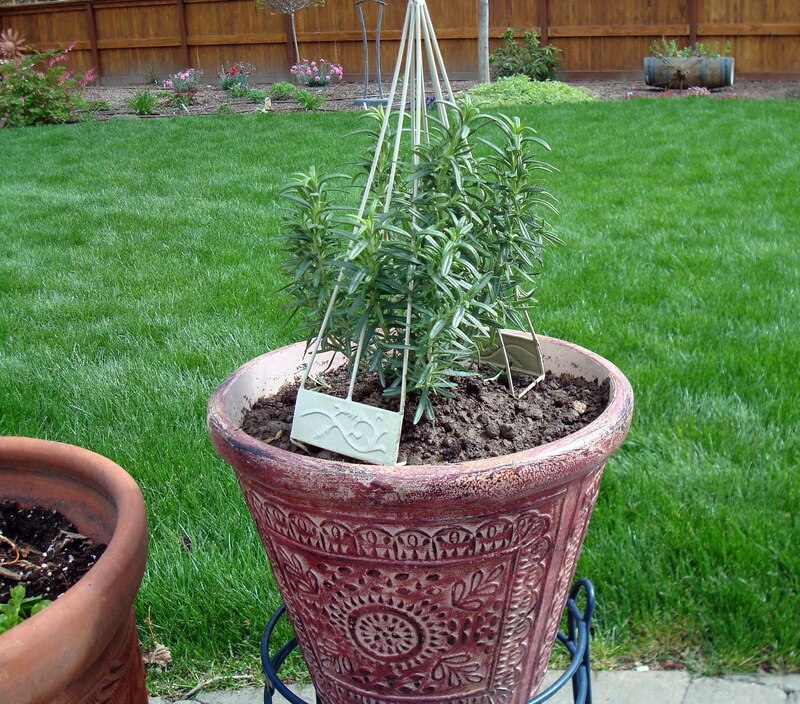 I had to get a new rosemary plant this spring. The winter got the other one. Love all your gardening posts! I long for when I can get my hands in the dirt! Lol! I have some Columbine too, but wow does it spread!! I've had to move it to a different spot because of it! I felt like I was always pulling it's offshoots. Is it native to Washington like it is here? your gardens look really neat. we got our first squash out of our garden yesterday, problem is, it is a mystery as to what the name of it is, we did not even know we planted that kind! I need to plant some herbs too, your are in a neat container. You'll be reaping the rewards of your hard work in just a few months! That apple variety sounds delicious. Love your garden art. Just be careful and don't overdo it in the garden! It looks very nice, and those apples will be delicious. 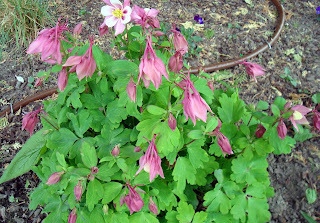 We have had Columbines too, in light purple. It is far too cold to plant any herbs yet, I need to wait about 4 weeks. I love your herb garden! I'm going to try to put a small one in in a large terra cotta pot but I think that all I'll be doing is offering up a salad bar to the deer. Love your columbine! I just planted a blue one. Don;t they have the prettiest blooms? 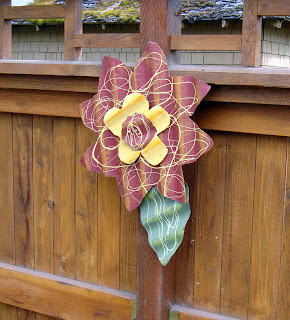 Love all your new yard art, especially the dragonfly! Your garden is so lovely! I can't wait to see all the goodies that will come from it. 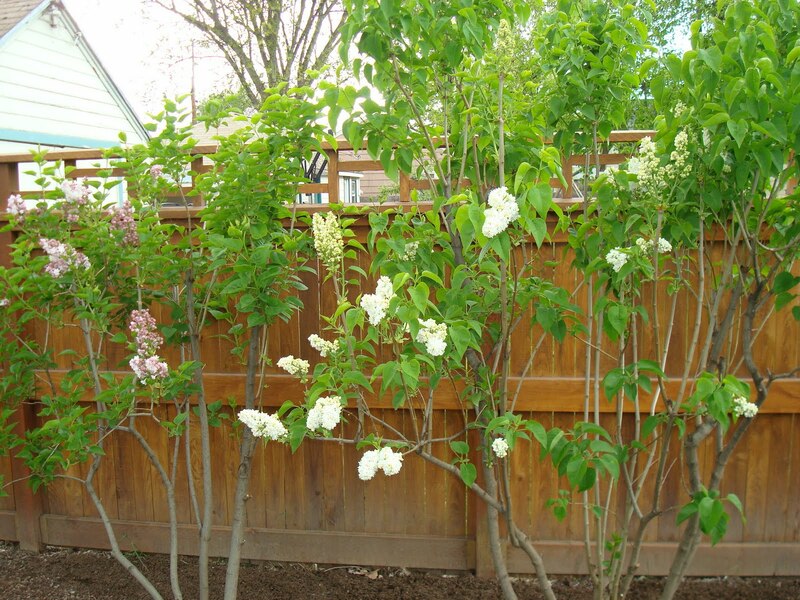 Your garden looks beautiful and will be worth all the hard work. 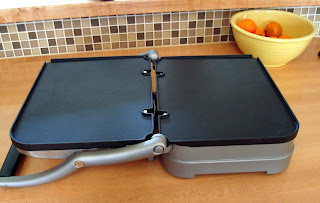 I have that Cuisinart griddle. Have had it for a couple of years and LOVE it. I make everything on it from pork chops, burgers, london broils/steaks, chicken, pancakes - you name it. Everything cooks very fast and we LOVE it. Must use it at least 3-4 times a week. Enjoy it - I know you will. I miss lilacs. I don't see them at all around here. 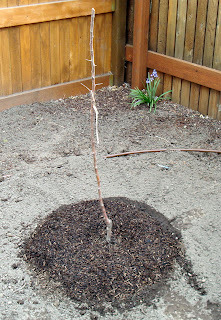 And your very own apple tree! Maybe in my next life! Your lilac blooms are beautiful! I could almost smell their sweet fragrance and the herbs look so cute. It is going to be wonderful when they fill up the container very nicely. It is a treat to see your growing garden. thank you, Candace! I'm sure your garden is going to look so spectacular in Summer. It is so useful to have a herb garden near the house. The little plants I bought this year are already growing! Isn't Spring exciting. You are having so much fun in your garden! The place where I live now is too much for me, and I am looking forward to having a smaller, more manageable yard to keep up. There are two raised planter beds that will be perfect for tomatoes and basil!